Meet madmoo. She lives in the United Kingdom. She will find a unique way of visually presenting your copy, be it with coffee, rocks, blocks, magnets or even alphabet-shaped pasta. Just a few of the creative typography options offered by madmoo. In a lesser world, finding someone to execute such a niche project could be a herculean task. Thankfully, we do not live in a lesser world. We live in a greater world, where you can hire madmoo — along with thousands of other freelancers specializing in any discipline you can imagine — for just $5. 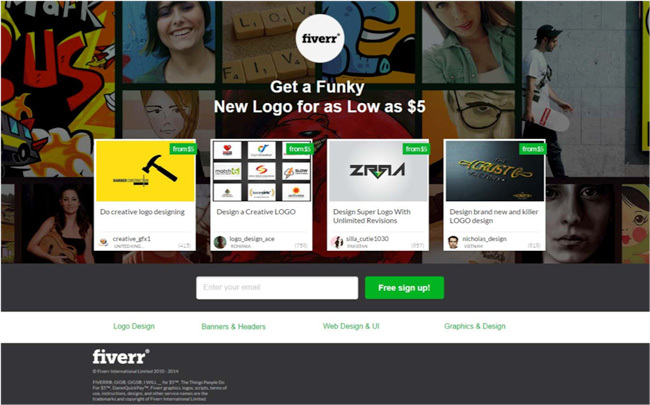 It’s all thanks to Fiverr, a marketplace that connects freelancers with clients in an ingenious way. And they’ve optimized their inbound marketing with the same kind of ingenuity: in less than a year, they’ve gone from 0 to over 400 A/B tests, and have some incredible results to show for it. Read on to find out how one marketer was able to increase the conversion rate of Fiverr’s landing pages by 457% in just ten months. Okay, But Can You Tell Me More about Fiverr First? Bootstrapped in 2009 by entrepreneurs Shai Wininger and Micha Kaufman, Fiverr was envisioned as a new way to approach buying and selling freelance work. Anyone with a service to sell — referred to as “Gigs” in Fiverr parlance — can set up their own virtual storefront among thousands of other writers, graphic designers, and decorative letter arrangers. Each gig starts at $5, but as sellers build their reputation, they’re permitted to add extras to their Gigs that can bring the total price closer to what you might expect of a typical freelancer. 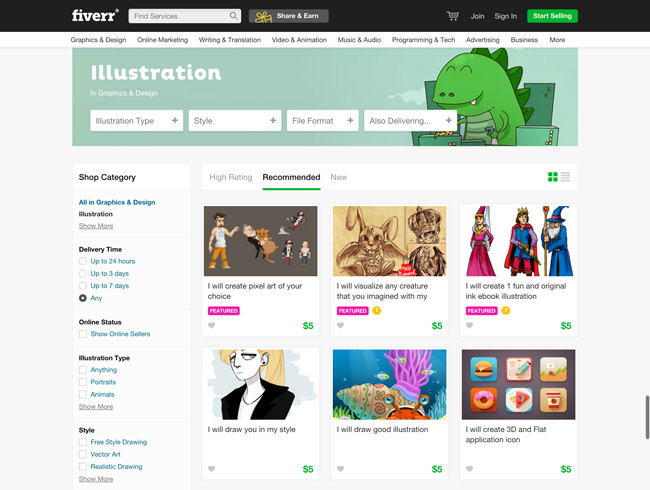 Illustration is one of the hottest service categories on Fiverr. But much like other hot technology services like Uber and Airbnb, the value in Fiverr is not the services being offered as much as it is the ease of procuring them. Fiverr lets you navigate contractors the way you would navigate birdhouses on Etsy, and ordering your gig takes just a few clicks. Initially launched without any funding, Fiverr is now home to over 3 million Gigs and raised a Series C round that brought their total funding to $50 million. While Fiverr was already growing at an incredible pace, there’s always room for improvement. And in 2014, Fiverr decided it was time to turn their attention to their underdeveloped A/B testing strategy. Yoav was hired in 2014 as a Growth Specialist and started off by working with Fiverr’s design team on small tests like altering the number of sample Gigs on shown on each landing page. But Yoav wanted to iterate more rapidly. I started learning design and analytics so I could become a ‘one-stop-shop’ for landing page optimization. Analyzing my own data and designing my own pages has allowed me to perform a lot of tests in a very short time. How many tests? In under a year, Yoav and Fiverr have run over 400 A/B tests,and the results speak for themselves: A 457% increase in landing page registrations in just ten months. Before showing off Yoav’s work, it’s necessary to mention just how seriously he takes his testing regimen. All of his tests have achieved a 99% confidence level, and with over 500,000 unique visitors across those 400 A/B tests, the results are pretty ironclad. Fiverr uses their landing pages as a destination point for their Google and Facebook pay-per-click ads. They use the same basic template across all of their landing pages; however, they create and test each variant in Unbounce, and make small tweaks to each page on a per-campaign basis. Fiverr’s landing page design before Yoav arrived. Logo design is one of the hottest types of Gigs on Fiverr; Yoav decided to take advantage of the massive traffic to the logo design landing page by testing his ideas there first, and then moving on to test the changes on other pages. 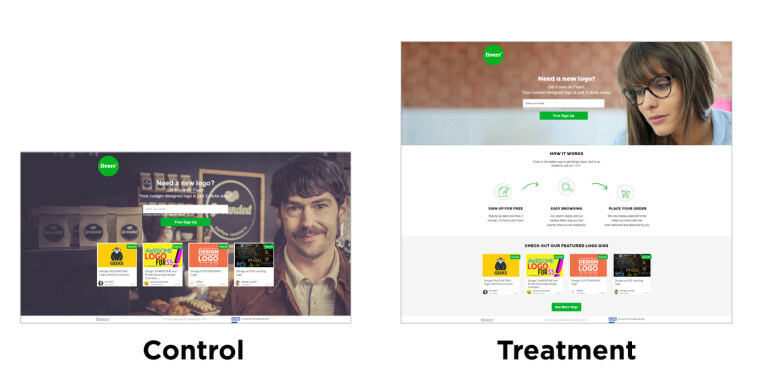 Below are just a few of the A/B tests Yoav ran on the logo design page using Unbounce, that ultimately contributed to Fiverr’s 457% increase in landing page registrations. The changes made in this test were so subtle, you might not notice them. But the winning variation resulted in a 23.5% lift in registrations, all from giving the primary content of the page a little more space to breathe. But why? It’s impossible to know precisely, but the obvious impact of adding whitespace around the header, subhead, form, and call to action is that the example Gigs — which were previously the focal point of the page — are pushed down, leaving the reader’s eye to land instead on the unique value proposition: a vintage logo from a professional designer, starting at $5. Prominent CTAs are another basic recipe in the optimization cookbook, but it’s hard to argue with results: just by moving the button to its own line, centering it, and widening it, Fiverr increased registrations by 27.3%. While the value of whitespace can be a bit nebulous, no one can argue against the strength of great copy. 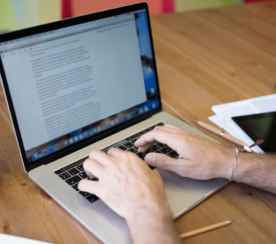 Design can set the mood, instill trust, and guide a user along the path to conversion — but the weight of making a clear and compelling offer rests on a page’s copy. The original headline and subhead were limp, and didn’t speak to the user’s needs. What if this user doesn’t need a “vintage” logo design? The new one is almost like a conversation with the reader. The new copy lead to a 29.81% increase in registrations. When a test produces a positive result, it can be tempting to pat yourself on the back and move on to the next challenge. Yoav must have thought the word “easy” was a bit vague, too; “your custom designed logo is just 3 clicks away” is a much more enticing and specific value proposition, and adheres to copywriting pro Marc Aarons’ 4U formula: it’s useful, urgent, unique, and ultra-specific. The increase in specificity and urgency lead to a 15.41% increase in registrations. With all of the knowledge gleaned from previous tests, Yoav and co. opted to just rip the whole thing out and make some big changes. Notably, they added an entire content block explaining how Fiverr works, and freshened up the page with a new, brighter look and more dominating human imagery. 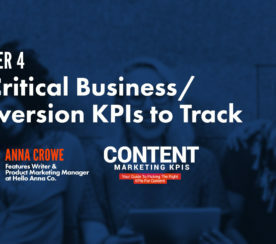 That positive result usually means an increase in your conversion rate, but you can aim to impact any metric that would result in a win for your business. When you make multiple changes at a time, you are also testing multiple hypotheses at once — and it can be difficult to find out which of your hypotheses turned out to be correct. Yoav collected the results of these smaller tests into a single page, and it was a big change that paid off: the new design resulted in a 57.74% increase in registrations, and serves as the foundation for Fiverr’s landing page designs to this day. None of Fiverr’s landing pages seemed to prioritize attention ratio, the number of interactive elements versus the number of campaign goals on the page (which should always be 1). 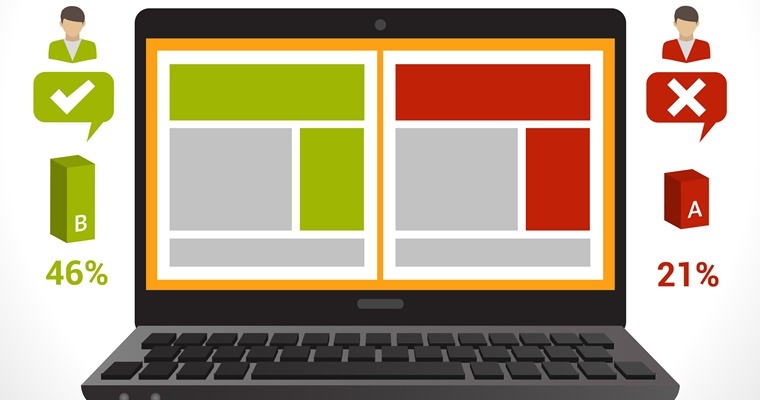 The goal of making the call to action the sole interactive element on a page, and thereby eliminating any other links, is to increase the likelihood of that user converting. A landing page is ideally focused on that single goal, which is what makes them a better option than simply dumping traffic on your landing page. But Fiverr’s landing pages have never had a 1:1 attention ratio, and this A/B test threw in yet another “distracting” element: a “learn more” button. The last thing you want someone to do is leave the page by clicking on a link, right? Well, maybe not. 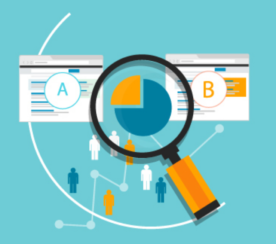 After all, there’s more to optimization than just getting more raw conversions. There’s also optimizing for the most valuable conversions. In this case, having more information available resulted in higher-quality leads, contributing to a 22% increase in orders. The icing on the cake was that this new variation also resulted in a 17% decrease in the page’s bounce rate, which increased their Quality Score and consequently lowered their cost-per-click in their PPC campaigns. Hard to argue with making more money for less money. Best practices are a framework designed for reproducible, somewhat predictable outcomes. But every rule has its exceptions, and those exceptions could be very lucrative — so make sure you test all of your ideas, even if they seem counter-intuitive. What Yoav has accomplished at Fiverr is remarkable. It’s also remarkably achievable for pretty much anyone. A year ago, Yoav knew less about conversion optimization than you do right now. Run as many tests as you can, and never put up a page without testing it. It’s a waste of traffic. Test everything. If someone requests a change you’re unsure of, don’t say no; test it and show the data. Only tests with 99.9% statistical significance are valid. Review each test two weeks after it is implemented to see if the variant is actually moving the needle. You need to perform separate tests across different acquisition channels, because users within each behave differently. Your philosophy doesn’t have to be the same as Yoav’s, and his success in testing is certainly enabled by the huge amount of traffic that Fiverr receives. But there’s no reason why you can’t apply the spirit of rapidly iterating and testing new ideas — even ones that run counter to “best practices” — to your work. This post originally appeared on Unbounce, and is re-published with permission. In-post Photos: Images by Fiverr. Used with permission. Screenshots by Brad Tiller. Taken July 2015.